Educator should look at the links on the visualization page to see connections to climate change. The visualization as a stand-alone does not connect to climate change. Educator must use other information at EPA climate change website to provide opportunities to make that connection. For example, the water resource impacts link at the top right brings the reader to a section that discusses the impact of climate change on regional water resources. Comment from expert scientist: The material does a very good job of explaining how the water cycle is already changing and the implications of such change. 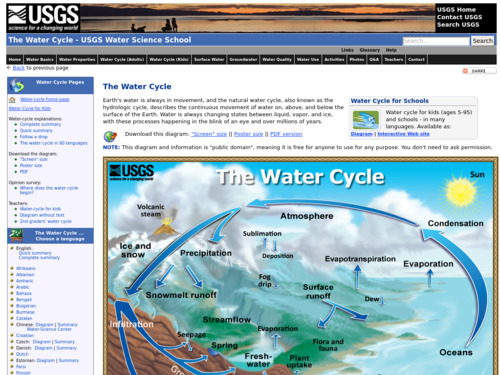 The water cycle graphic from USGCRP (2009) is very appropriate. This visualization provides a comprehensive overview of the water cycle without adding a lot of potentially confusing details. It will work well as a focal diagram for a unit on the water cycle. The diagram can be viewed online and saved from a web browser. Images in other formats and sizes are not available.